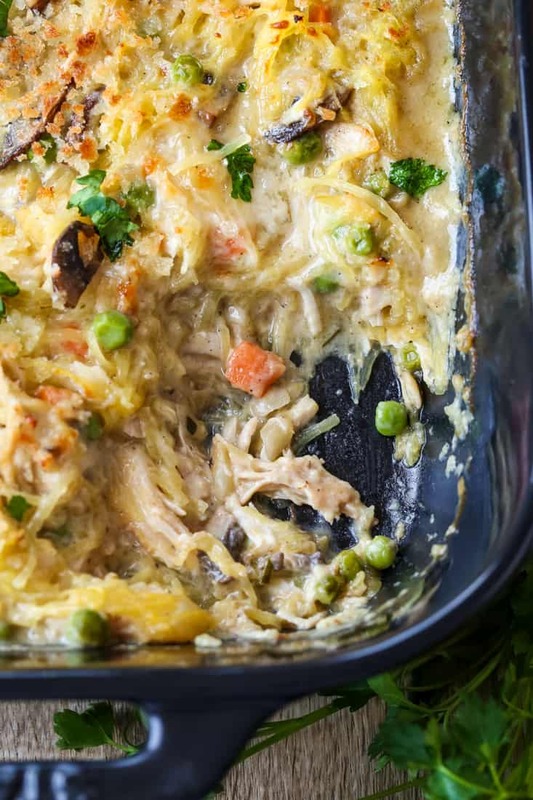 We love this Chicken Pot Pie Spaghetti Squash Casserole for a low carb dinner! All the flavors of chicken pot pie in a comforting, low carb casserole! Low carb dinners are often on the menu at our house! Try our Naked Sheet Pan Tacos on taco night or this super tasty Sausage Stuffed Chicken Rollatini! Spaghetti squash is so popular these days, but I can tell you, my mom has been making it since the 70’s. She would bake it, scrape out the strands and top it with meat sauce and parmesan cheese. She was so ahead of her time you guys…and we hated it. There’s honestly not much we ever turned our noses up at, but this was one dinner I remember not loving. Fast forward 30 years and now it’s one of my favorite dinners ever! I’m lucky that our boys love it too, because we get to make spaghetti squash all the time! All you need to do is follow our simple guide! 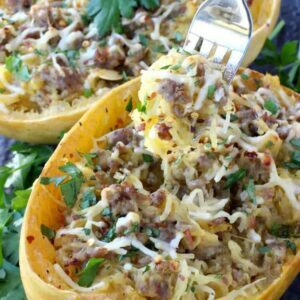 We actually wrote a whole post on cooking spaghetti squash since some people seem to be afraid to try it. Following a couple of tips (like how to cut those darn things) will get your perfectly cooked spaghetti squash on the table in no time! 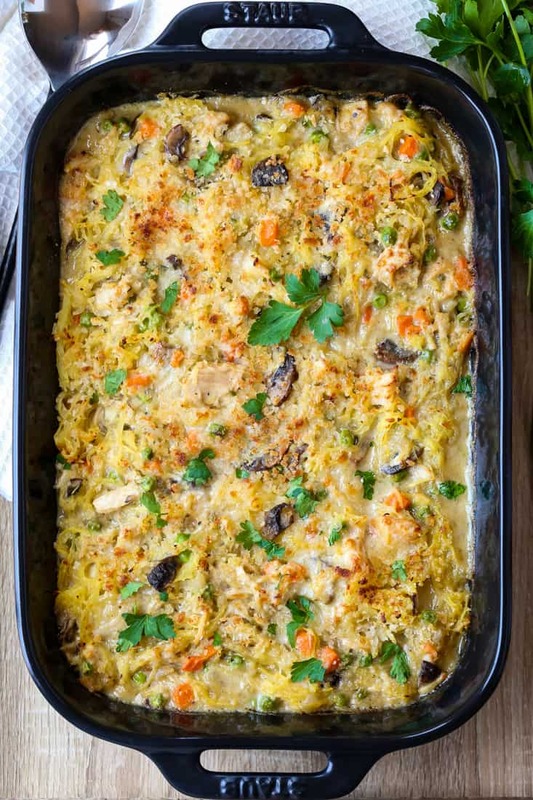 So like we mention in the post, this casserole recipe will cook the spaghetti squash again so you don’t want to overcook your spaghetti squash from the beginning. 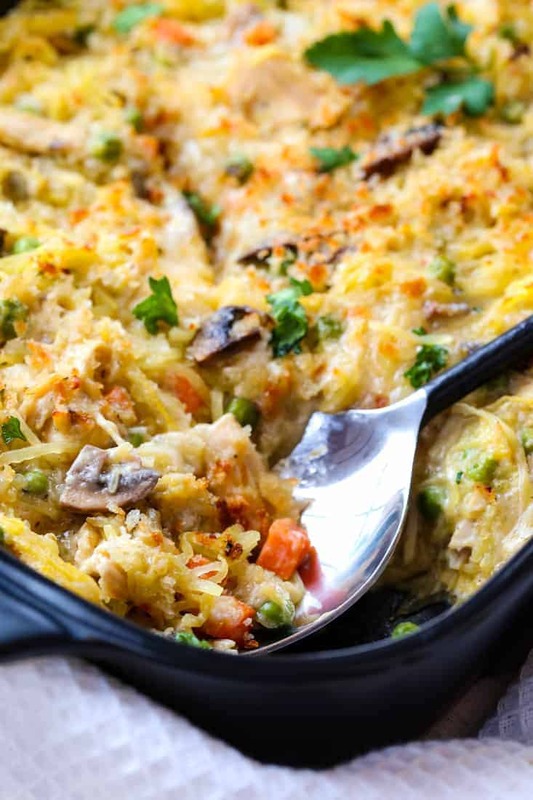 A firmer, more “al dente” spaghetti squash will work best in this casserole recipe. See how you can still see the individual strands of spaghetti squash? They don’t turn into mush after the casserole is cooked because you cooked it the right way! Because mushy spaghetti squash is, well. Mushy. And that’s not delicious or comforting. 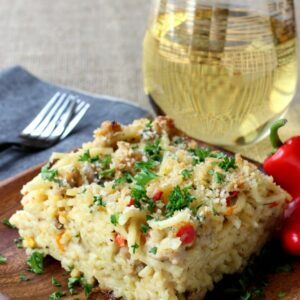 This chicken casserole recipe says it serves eight…here’s a scoop that we took out as a portion. 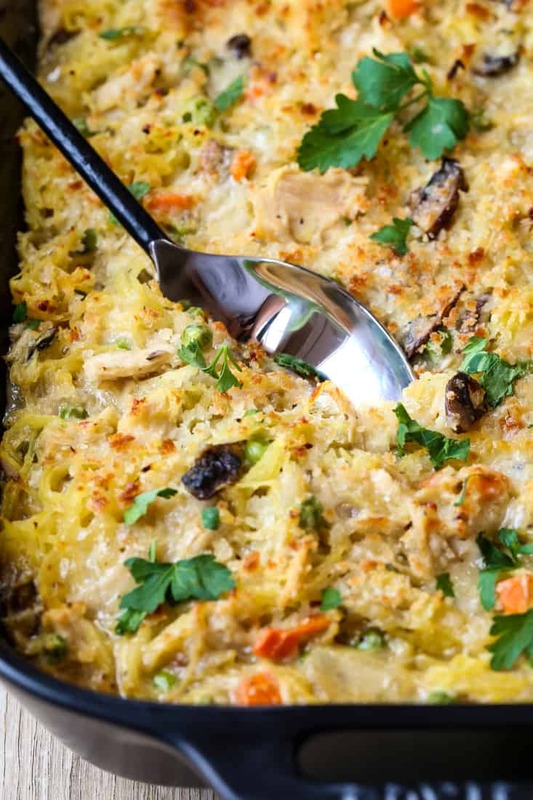 This spaghetti squash casserole is so rich and delicious, you don’t need a whole lot. Unless you are a 15 year old boy coming home from baseball practice. Then, I guess you eat half the casserole. So portions are a little off in our house, but if you serve a scoop like that with a salad on the side you’ll easily get nine servings. 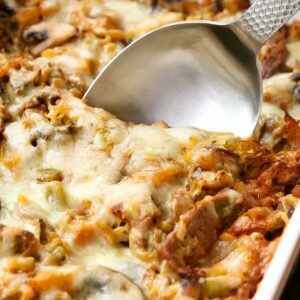 This spaghetti squash casserole taste just like your favorite chicken pot pie recipe, but a lower carb version! Add the onions, stirring into the butter and cook until the onions have completely softened, about 10 minutes. Stir in the garlic and cook one minute longer. Add the mushrooms, salt, pepper, poultry seasoning and rosemary then cook until the mushrooms are browned, about 5 minutes. Stir in the frozen peas and carrots then add the flour and stir to combine. Cook for a minute while stirring, then slowly pour in the milk. Using a wooden spoon, scrape up the bottom of the skillet and stir the milk into the vegetables. Let the filling come up to a simmer and then let thicken for 3-4 minutes. Stir in the chicken and 1/4 cup of the parmesan cheese, then remove the skillet form the heat. Taste for seasonings and adjust if needed. Pour the filling into a large bowl along with the cooked spaghetti squash. Stir gently to combine the filling, then pour into a 9" x 13" baking dish that's been buttered or sprayed with cooking spray. Top the casserole with the remaining parmesan cheese and breadcrumbs then bake for 30 minutes. To brown the topping even more, place the casserole under the broiler for 3-4 minutes. 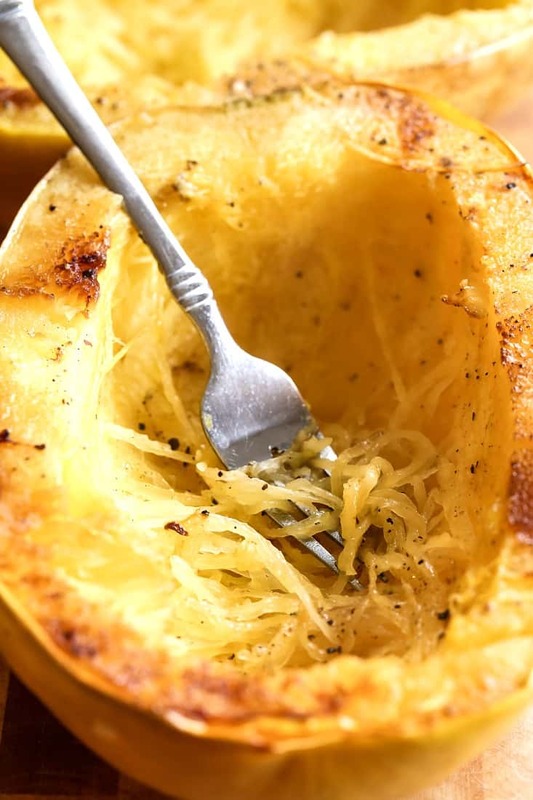 *Follow this simple guide for the best way to cook spaghetti squash! You'll need a large spaghetti squash to yield 5 cups.